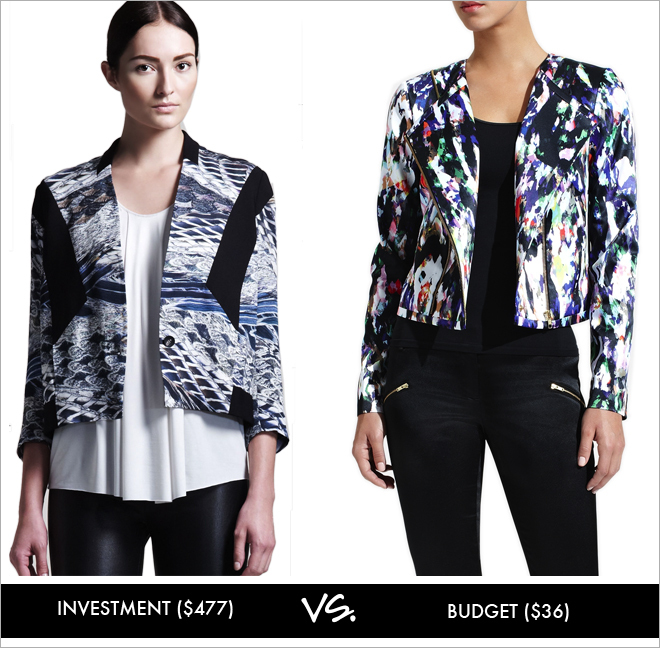 If you are looking for a cropped printed jacket this spring/summer, I have found two options - an investment piece by Helmut Lang or a more budget-friendly option by The Limited. I like the Pheasant print (or somewhat snake-like, as it looks to me) of the Helmut Lang jacket with the solid black panels; however, I like the mix of reds/greens/blues with the black and white of The Limited jacket. I don't think you can tell in the picture, but The Limited jacket has a satin (more shiny) finish. Also, it is only $36, which is mark down from $128. If you want to try a printed jacket this season, but don't make the investment, I think the Limited jacket is a great option. I really like to Limited jacket better! Great price!